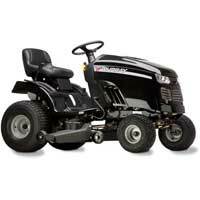 The Murray side discharge tractors with foot operated hydrostatic automatic transmission will make mowing fun. With three cutting blades, they are ideal for large gardens. A large side deflector disperses the grass evenly. These two tractors equipped are equipped with the hydrostatic transmission and larger cutting decks ofer the mulching kit as a standard feature. Conversion from side discharge to mulching is quick and easy. All tractors have a wide leg space and can be easily accessed. The height control is mounted on the fender and can be reached confortably.